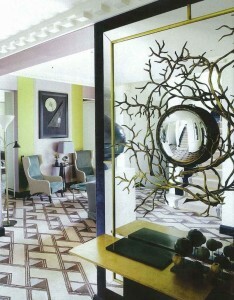 from the latest Australian Vogue Living (photographed by Richard Powers). The Baroness de Pampelonne has created a spectacular apartment in Paris for a wealthy Russian client, who received the apartment as a present. As you do. Its absolutely stunning, and easily one of few spaces I’ve ever seen I feel I could move right into without changing a single thing. The colours, the furniture, the art…the mix is perfection. I spy pieces by Hervé Van der Straeten, Gio Ponti, Eric Schmitt, Angelo Mangiarotti, Les Lalannes, Baguès, Ico Parisi, Jean Royere, Otto Wagner and Philippe Hiquily…its like a roll call of my favorite designers! I won’t spoil it for you by posting all the images, even though I’m tempted. So make sure you go buy a copy, because the entire apartment is to die for.